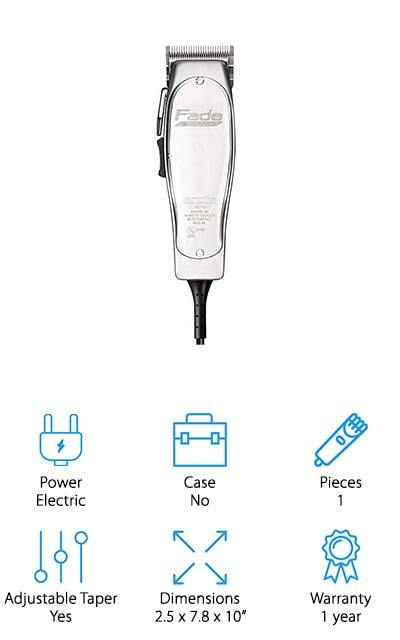 Whether you’re looking for something new for your shop or want to do haircuts at home, using the best clippers available helps you get the best looking results. There are a lot of options available out there which is why we did the research and put together these professional barber clippers reviews. Let’s take a closer look at some of the key features to keep in mind while you shop before we move into our top picks. Power: We found some great options for both corded and battery-powered clippers. In fact, we even found a few that work either way. There are pros and cons to each type so choose what you think is a good fit. Case: Some of these clippers come with a lot of different attachments and having a case is a convenient way to keep everything together. That said, a good pair of clippers doesn’t need a case. It’s just a nice thing to have. Pieces: This includes things like comb attachments, charging docks, oil and cleaning brushes, and even small trimmers. Some of these products come with everything you could possibly need while a few are just a solid pair of reliable clippers. Adjustable Taper: For clippers with an adjustable taper, you can make slight adjustments to the blade without having to change any comb attachments. These kind of clippers are usually perfect for really shortcuts, tapers, and fades. Dimensions: If you want to know how big the clippers are, this is the place to look, especially if you have small hands or are looking for something compact. There’s a nice range here so you should find what you’re looking for. Warranty: Good news! Every product on our list is covered by a warranty and they last anywhere from 1 to 5 years. Pay close attention to the kits that come with addition trimmers as they’re usually covered under their own warranty. Now that you know what to look for, let’s move into our barber clippers reviews. In a hurry? The best thing to do is start with our top and budget picks. They’re right at the top of our list so they’re easy to find and will give you a pretty good idea of the range of products available. All of these clippers are superior products, though, so be sure to stick around if you can. Okay, let’s go! Are the OSTER Classic 76 Clippers the best barber clippers in the world? We think so, which is why we made them our top pick. For one thing, they’re really powerful and made for heavy-duty use so they’re perfect for a professional. The textured housing and ergonomic design are easy to work with, even for long periods of time and multiple haircuts back to back. That’s not all, the break-resistant housing and 9-foot power cord make them a good choice for a shop but they’re great for home use, too. They’re designed to cut through all hair types, wet or dry. These clippers come with everything you need for maintenance, including oil, grease, and a cleaning brush. You also get 2 detachable blades to get you started. The best barber clippers to buy if you’re on a budget are the Wahl Clipper Elite Pro Haircut Kit. The powerful, durable motor was built to last and is covered by a 5-year warranty. Thanks to the self-sharpening blades, these clippers cut hair faster than most comparable products. This kit includes a complete set of guide combs that feature easy to read sizes to make sure you always choose the right one. In all, you get 10 guides in sizes ½ to 8, or 1/16-inch to 1 inch. That’s not all, this kit also includes everything you need to give a professional haircut including styling shears, a comb, a haircutting cape, and a case to store it all in as well as a blade brush and oil for maintenance. If you’re in the market for both barber clippers and trimmers, this combo set from Andis is worth a closer look. It includes clippers that have a lightweight, balanced design that’s comfortable and easy to use. The ergonomic, compact shape fits nicely into the palm of your hand. That’s not all, it also runs really quietly and features cool running operation which helps extend the life of the motor. A hanger loop comes in handy for easy storage and helps make sure it’s always in reach. The trimmer is perfect for dry shaving, outlining, and getting the perfect fade. The clippers have an adjustable taper plus you get 6 different combs. That’s not all, there are 4 combs for the trimmer, too, which makes this set extremely versatile. You’ll be able to create a wide range of styles. 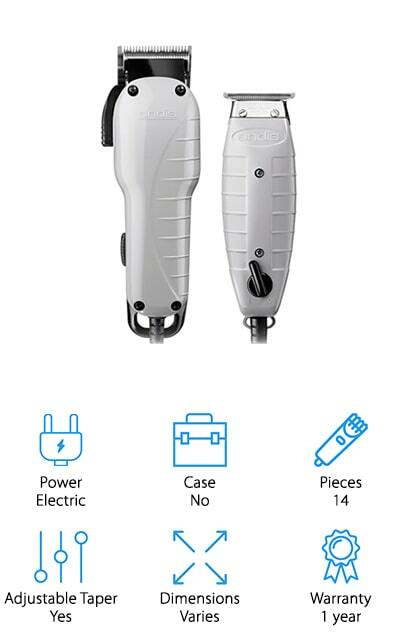 The OSTER Fast Feed Motor Clipper has a powerful, whisper-quiet motor that cuts through all types of hair, wet or dry. The ergonomic design and textured housing provide a nice grip that’s comfortable enough to use professionally all day and makes it easier to do haircuts at home, too. A fast-feed clipper helps them run quietly and gets hair through quickly for fast results without the loss of precision. There’s more, not only does the blade adjust from 000 to 1, but there are also 4 guide combs included which allow you to create a variety of hairstyles. Plus, the power cord is 8 feet long and won’t get in your way. These clippers are available in 10 different colors. They come with a blade guard, lubricating oil, and a cleaning brush. Next up for best barber clippers set is this one from Woner. The modern design really stands out and has a lot of cool things to offer. It’s equipped with ceramic and titanium blades which are much harder and more durable than steel. The thin, compact body makes it ideal for travel plus it’s easy and comfortable to use. That’s not all, the battery charges completely in 2 ½ hours and runs for up to 300 minutes. 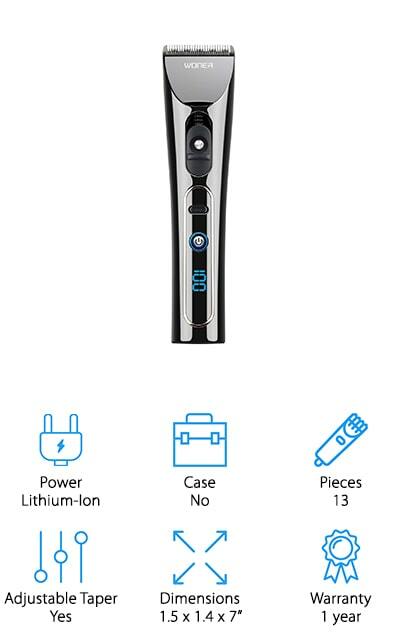 Something about these clippers that really jumps out is the bright blue LED display that indicates battery level, charging level, and allows you to select turbo mode for when you need extra power to get through thick or textured hair. With the adjustable taper and 8 different comb attachments, you can create a variety of styles. A great choice for best barber clippers for black hair is the Andis Professional Fade Master Hair Clipper. The really cool thing about these clippers is you don’t need any additional comb attachments because these clippers are fully adjustable. What do we mean? You can adjust from ⅛ to ⅜ inch right on the clippers themselves. It uses an easy to control side switch to change between the various lengths which makes these the perfect tool for close clips, tapering, and fades. The lightweight aluminum housing is really durable and built to last. A high-speed motor clips at 14,000 strokes a minute and cuts fast and smooth. It also runs quietly and coolly to keep the thing working smoothing for as long as possible. Our next pick for best professional barber clippers is from Sminiker. They feature a titanium and ceramic blade that won’t rust and keeps its edge for a long time. That’s not all, they also have an innovative R-shaped rounded edge design to prevent any irritation to the skin. The compact design is easy to hold onto and provides superior control for more accurate styling. Not only is there an adjustable taper, but this set also includes 6 different guide combs so you can easily achieve the perfect length. 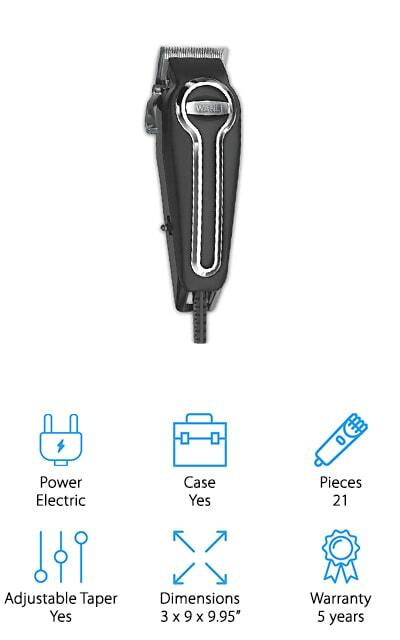 One of the most impressive things about this product is the battery. 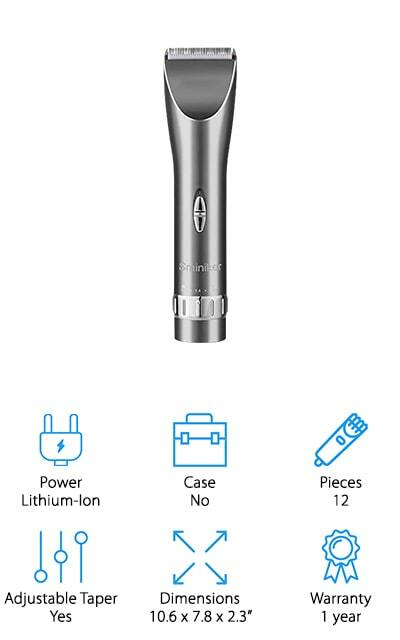 It takes about 2 or 3 hours to completely charge and has a run time of up to 8 hours. Plus, you can continue using it when it’s connected to the charger. 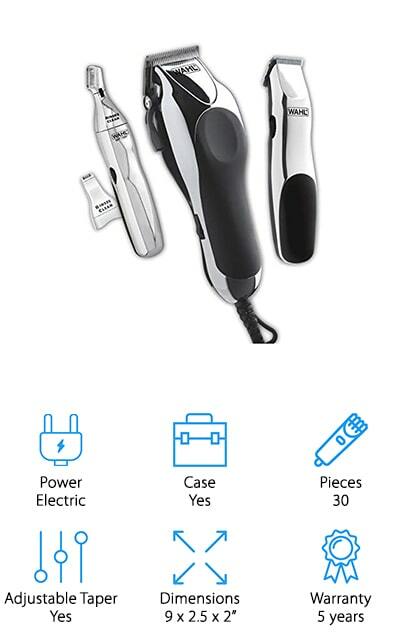 Another good performer if you’re looking for something cordless is the Queetus Hair Clippers Electric Trimmer. The titanium and ceramic blade is adjustable and it comes with 6 guards so you can cut from 0.8 mm to 18 mm. That gives you a lot of versatility with styling. An R-shaped rounded edge moves smoothly and prevents any skin irritation and there are even 3 different rotating speeds so you can change the settings to suit different hair texture for maximum comfort. 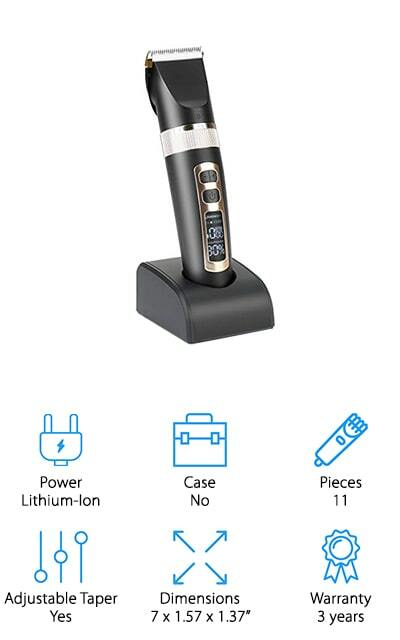 This is a great choice for travel because it works with 110 or 240 V. It comes with a convenient charging stand and takes about 3 hours to reach full charge. And get this, a full battery will last for up to 5 hours of continuous cutting. 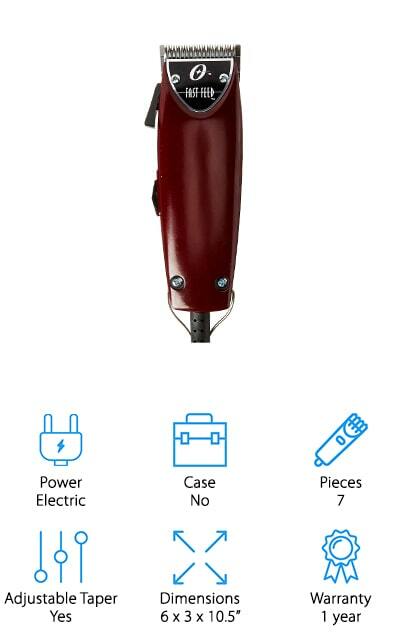 Next up is the GEEDAR Hair Clippers. These clippers are made for professionals and have some really awesome features. For one thing, there are 11 adjustable speeds which deliver precise results no matter what hair texture you’re working with. The built-in lithium-ion battery charges on a dock and a full battery lasts up to 7 hours. The easy-to-read LED display lets you know just how much power is left but that’s not all. You also have the option to use these with the cord if it’s time to charge and you’re not quite finished. Self-sharpening titanium and ceramic blades work smoothly and accurately and they last a really long time. Plus, with an adjustable taper and 4 different combs, you can create a lot of styles with these clippers. Last up are the best barber clippers for fades, the Wahl Home Barber Kit. This is a complete 30-piece kit that has just about everything you need to create any style you can imagine. 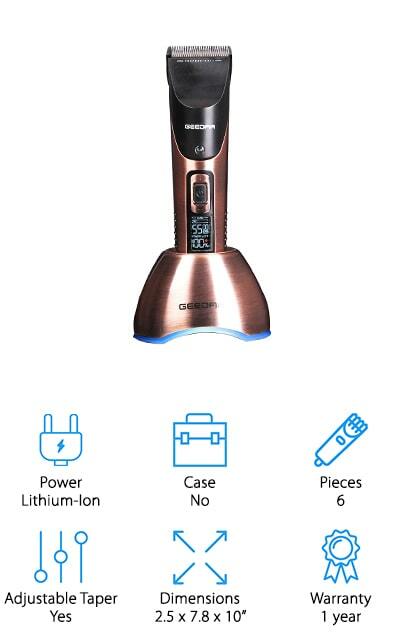 Not only does it come with clippers, but you also get a small touch-up trimmer and an even smaller personal trimmer. Each is equipped with self-sharpening stainless steel blades while the clipper has special precision ground blades that help it cut through any hair, no matter what the texture. It’s also equipped with a heavy-duty motor that delivers a lot of power yet it’s still gentle enough that it won’t snag. This kit also includes 12 comb attachments, combs, scissors, and much more. 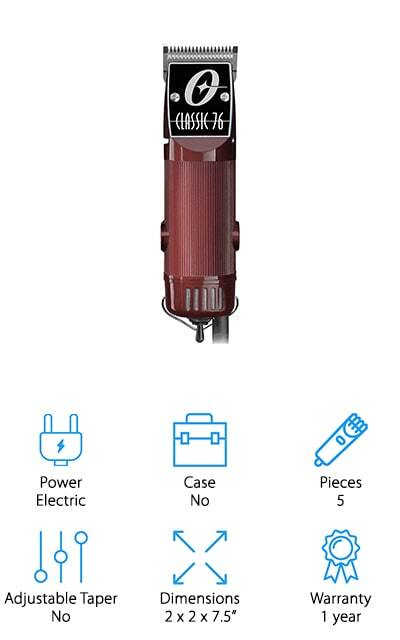 The clipper is covered by a 5-year warranty and the 2 smaller clippers, 2 years.